It is unusual for a jurist to find himself in the role of witness. But in the case of Elder Dallin Harris Oaks, it is a role he will soon become used to filling. Sustained as a member of the Quorum of the Twelve Apostles at general conference April 7, Dallin Oaks is in the process of moving from the Utah Supreme Court bench to a lifelong role as a special witness of the Lord Jesus Christ. And how does he feel about the calling? He paused a moment for reflection. Indeed, it was the farthest thing from his mind when a telephone call from President Gordon B. Hinckley, Second Counselor in the First Presidency, came to him at a crowded, noisy Tucson, Arizona, restaurant the evening of April 6. Justice Oaks had traveled to Arizona to serve on a panel of judges for a moot court competition; he and some of his academic colleagues were dining with some of the students who had participated. He arranged to return the call from the relative peace of his hotel room. There were two immediate difficulties for Brother Oaks, about which President Hinckley was very understanding. His original travel plans called for him to fly to Chicago from Tucson on Saturday in connection with his responsibility as chairman of the board for the Public Broadcasting Service. For several months, PBS had been looking for a new president, and Chairman Oaks was in charge of the search. He would be interviewing candidates and conferring with the Search Committee, whose members were already en route to Chicago or scheduled to come to this vital final meeting. Then there was the matter of his responsibilities on the Utah Supreme Court. He had heard arguments and participated in the tentative decisions on cases for which opinions had not yet been issued. If Justice Oaks were to switch immediately to his new Church role, it would seriously disrupt the work of the court in some of those cases. “It would be the equivalent of a death [on the court],” he explained. And yet he obviously could not continue to function on the bench once he had commenced service as a member of the Council of the Twelve. It was President Hinckley who suggested the solution to the dilemma. Of course Elder Oaks must carry through with the obligation in Chicago, and he would not commence his service as a member of the Twelve for several weeks, allowing time for him to clear away the most pressing of his court obligations. But he would be sustained at the opening session of conference. The decision meant he would not take his place in the Tabernacle on Temple Square for Sunday sessions of general conference. Watching those sessions on television, when he wanted to be assuming his duties with his new quorum, was a difficult experience emotionally, he commented. Talking the calling over with his wife, June, by long distance took far longer than being interviewed by President Hinckley, Elder Oaks recalled, smiling. Their children learned of his new calling only when he was sustained in conference. Like his wife, they were excited, and very supportive. Their five older children﻿—Sharmon (Mrs. Jack Ward), Cheri (Mrs. Louis E. Ringger), Lloyd (married to Natalie Mietus), Dallin Dixon (married to Marleen May), and TruAnn (Mrs. A. Rock Boulter)﻿—are now building their own families. Only daughter Jenny, eight years old, is still at home. Sister Oaks is awed by the calling extended to her husband. It will be a challenge, she knows, to learn how best to support him. Would his mother be happy? Elder Oaks feels she is; she died four years ago. Stella Harris Oaks never remarried after her husband, Dr. Lloyd E. Oaks, died when Dallin was just eight. Sister Oaks was an exemplary mother to her three children, as well as prominent in Church and community service in Provo, Utah, where she was widely known as an influence for good. 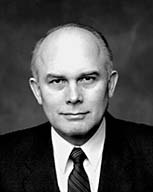 The name Dallin Oaks has also become widely known as an influence for good, in a variety of Church, educational, and civic service. Of course, there were his nine landmark years (1971–80) as president of Brigham Young University. He became prominent not only as an educator who insisted on academic excellence, but also as a defender of religious liberty, via efforts to prevent what he saw as unconstitutional or unwarranted federal interference in private university affairs. He has also served for several years in executive positions with PBS. He has been an officer or director of a number of prestigious educational or legal organizations. He was an outstanding law student and later a noted professor of law at the University of Chicago; after law school, he served as clerk to Chief Justice Earl Warren of the United States Supreme Court. He played an important role in writing the Bill of Rights for the new constitution Illinois voters adopted in 1970. He is also an author, scholar, and accomplished teacher. The list of personal achievements is long. Church service has not been neglected in his life. In Chicago, he served as stake mission president and as a member of the Chicago South Stake presidency. During the years at BYU, he served as a Regional Representative. But Elder Oaks feels a deep sense of humility when he looks at his own Church service and then at the service of those in the quorum he will be joining. Then the mountain he knows he has to climb seems to grow even taller. He will probably approach it in the manner that has served him well before. He outlined it in a 1981 Ensign article.